1 of 3 Heat oven to 375 F. Line a large baking sheet with foil. Wipe mushrooms with a damp cloth. Trim stems; remove and chop finely. Place caps, curved-side down on prepared baking sheet. 2 of 3 Heat prosciutto in a 10-inch nonstick skillet over medium-high heat. Cook 4 minutes, until sizzling. 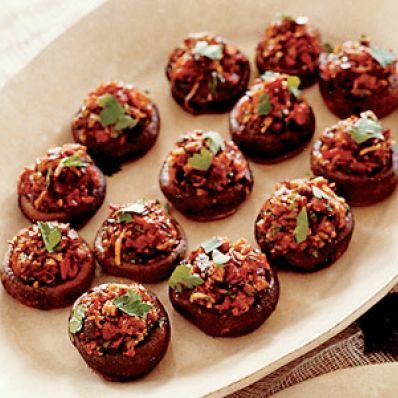 Reduce heat to medium and add diced mushroom stems, tomatoes and 1/4 cup water to skillet. Cook an additional 4 minutes until most of the liquid has evaporated. Remove from heat; stir in breadcrumbs. Cool 2 to 3 minutes, then stir in egg yolk, grated Parmesan, parsley, oregano and garlic powder. 3 of 3 Gather stuffing together; if it does not hold together, add 1 tablespoon water. Mound stuffing into mushrooms, a generous tablespoon for each. Bake mushrooms at 375 F for 15 to 18 minutes, until browned on top. Let cool slightly before serving. Per Serving: 17 mg chol., 3 g pro., 30 kcal cal., 131 mg sodium, 0 g fiber, 0 g sat. fat, 1 g Fat, total, 2 g carb.